Ex vivo expansion of hematopoietic progenitors is considered as an attractive tool to increase the number of stem and progenitor cells (HSPCs) for cell therapy. The efficacy of ex vivo expansion is strongly depends on the feeder cell activity to mimic hematopoietic microenvironment. Here we demonstrated, that combination of mitomycin C-induced growth arrest and tissue-related O2 (physiological hypoxia) modulated stromal capacity of adipose tissue derived stromal cells (ASCs). Growth arrest did not affect viability, stromal phenotype and multilineage potential of ASCs permanently expanded at tissue-related O2. Meanwhile, the PCR analysis revealed an up-regulation of genes, encoded molecules of cell–cell (ICAM1, HCAM/CD44) and cell–matrix adhesion (ITGs), extracellular matrix production (COLs) and remodeling (MMPs, HAS1) in growth-arrested ASCs at physiological hypoxia in comparison with ambient O2 (20%). The number of ICAM-1 positive ASCs was increased under low O2 as well. These alterations contributed into the ex vivo expansion of cord blood HSPCs providing the preferential production of primitive HSPCs. The number of cobblestone area forming cell (CAFC) colonies was 1.5-fold higher at physiological hypoxia (p < 0.05). CAFCs considered as long-term culture-initiating cells (LTC-IC) known to support long-term hematopoiesis restoration in vivo. The presented data may be applicable in the development of upscale protocols of HSPC expansion. The use of organ-on-a-chip (OOC) devices is a promising alternative to existing cell-based assays and animal testing in drug discovery. A rapid prototyping method with polydimethylsiloxane (PDMS) is widely used for developing OOC devices. However, because PDMS tends to absorb small hydrophobic molecules, the loss of test compounds in cell-based assays and increases in background fluorescence during observation often lead to biased results in cell-based assays. To address this issue, we have fabricated a glass-based OOC device and characterized the medium flow and molecular absorption properties in comparison with PDMS-based devices. Consequently, we revealed that the glass device generated a stable medium flow, restricted the absorption of small hydrophobic molecules, and showed enhanced cell adhesiveness. This glass device is expected to be applicable to precise cell-based assays to evaluate small hydrophobic molecules, for which PDMS devices cannot be applied because of their absorption of small hydrophobic molecules. Maintaining the homogeneity of a stem cell population is one of the challenges in bioprocessing prior to therapeutic applications of stem cells. Concerning human induced pluripotent stem cell (hiPSC) colonies cultured on feeder cells, cells at the peripheral region of the colony were found to have a higher average movement rate than cells at the central region of the colony. This spatial difference in average movement rate might lead to spatial heterogeneity of cell fate decision in the colony. We have developed a kinetic model to clarify the origin of this phenomenon which was difficult to understand by in vitro studies alone. Using a kinetic model based on a cellular automaton, we described fundamental cell behaviors including cell division, contact inhibition, cell migration, cell–cell connections, and cell–substrate connections. With all parameter values estimated from experimental data, the appropriateness of our kinetic model was indicated by good agreement between simulated and experimental data. Using the kinetic model, the average cell movement rate in a colony became homogenous after cell division stopped, implying that cell division was the main cause of the observed spatial heterogeneity. The result also showed a directly proportional relationship between the frequency of cell pushing and cell movement rate in the colony, confirming the role of cell division. Our kinetic model is expected to be useful for studying behaviors of hiPSCs and proposing good strategies to improve hiPSC bioprocessing. Selenite (Se(IV)) in artificial wastewater under high-salinity conditions of 70 g/L was treated by using sequencing batch reactors (SBRs). Activated sludge derived from a municipal wastewater treatment plant was acclimated to high salinity and was subsequently subjected to Se(IV) treatment. Two SBRs with different operating conditions, SBR-A and -B, were tested; the former was fed with influent containing a higher concentration of Se(IV) at 100 mg Se/L, whereas the Se(IV) concentration of influent for the latter was increased stepwise at 20–100 mg Se/L. Both SBRs showed high removal efficiency of up to 98% from the beginning. The removal efficiency gradually worsened in the middle stage, from the 11th and 16th batches in SBR-A and -B, respectively. After the 18th batch, a batch cycle with twice the duration was employed, and the removal efficiency was recovered from the 20th batch onward in both SBR-A and -B. This indicated that the hydraulic retention time is an important factor in maintaining efficient and stable performance of Se removal. The mass balance analysis revealed that Se was removed mainly through biovolatilization, which was attributed to a carbon source containing proteins or peptides. This study was the first to investigate the possibility of using biotreatment for Se-containing saline wastewater. Biodiesel is one of the best alternative to depleting fossil fuels for transport sector. However, biodiesel production via lipase mediated transesterification has limitation of high costing microbial enzymes. In order to overcome this limitation, a process of sequential treatment of oil industry wastewater using isolated lipolytic bacterial strains and biodiesel production from non-edible plant oils was studied. In this study, efficient lipase producing bacteria were isolated and evaluated for production of biodiesel from mustard, soybean, jatropha and taramira oils utilizing methanol for the transesterification of oils and bioremediation. Selected strains were then identified, using 16s rRNA sequencing. Further, Bacillus subtilis strain Q1 KX712301 was optimized for biodiesel production from non-edible taramira oil via Plackett–Burman and central composite design. Highest volumetric yield of biodiesel obtained was 102% at optimized parameters. Finally, a sequential bioremediation of vegetable oil contaminated wastewater and then microbial production of biodiesel from non-edible taramira oil was carried out using efficient lipase producer B. subtilis strain Q1 at optimized conditions. During sequential process, complete chemical oxigen demand reduction of oil containing wastewater and theoretical volumetric yield of biodiesel was achieved. Gas chromatography/mass spectrometry chromatogram revealed that the total fatty acid methyl ester content of the produced biodiesel was >98% which is in accordance with the biodiesel quality standards specified by both ASTM and EU-14103. Methanotrophs are of great interest due to their distinguish ability of recovering value-added commodities such as methanol and lipids while mitigating methane. 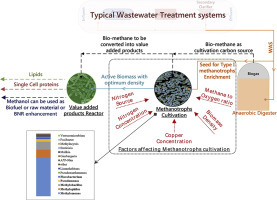 The enhancement of methanotrophs cultivation process conditions is a pivotal step to develop a feasible methanotrophic bioreactor. In this study, multiple batch tests have been performed to evaluate the aqueous growth medium elements including nitrogen, copper, and biomass density and the gaseous headspace composition influence on methanotrophs activity and the associated microbial community. It was found that increasing copper concentration to 20 μM and nitrate concentration to 40 mM result in higher growth rate and yield. In contrast, increasing the biomass density resulted in a declination in the growth rate and yield. The 16S rRNA gene sequencing shows that the used culture was dominated by type I Methylomonas genus at relative abundance of 60.9% compare to 1% of the enriched population for type II and type III methanotrophs. Thereafter, the specific nitrate uptake rate has been determined to be ranging from 0.05 to 0.62 mgN-NO3/mgTSS/day based on the cultures OD600. The attained results would facilitate the continuous cultivation of type I methanotrophs dominated culture as a first step for any methanotrophic based biotechnology. The role of sugarcane vinasse as a nutrient source and the impacts of different inoculum pretreatment methods (acid-thermal and thermal treatment) were assessed in acidogenic systems aiming to produce value-added short-chain organic acids (SCOA) and alcohols. In-depth microbiome characterization was also conducted by high-throughput sequencing of the 16S rRNA gene using the Miseq Illumina platform. SCOA production was 47.3 % higher in vinasse-fed reactors, with isobutyric (up to 10.3 g L−1) and butyric (up to 10.6 g L−1) acids as the primary metabolites most likely resulting from lactate conversion. Ethanol comprised the main product from solventogenic pathways in all conditions, with values ranging between 2.7 and 5.2 g L−1, whereas no butanol was detected. Microbial analyses revealed high relative abundance values for the Clostridium, Lactobacillus, Bacillus and Ruminococcus genera, with the predominance of the Clostridium genus (17%) in acid-thermal treatment reactors and the Lactobacillus genus (37%) in thermal treatment reactors. Overall, vinasse proved to be a suitable substrate for value-added SCOA production, which characterizes a potential management approach to this wastewater stream. In this sense, the biochemical production of butyrate from vinasse could diversify the product portfolio of sugarcane biorefineries, also minimizing bioenergy losses by converting residual carbon fractions. Nitrogen fixation in purple non-sulfur bacteria (PNSB) does not take place even in N-free medium when they are cultured under aerobic conditions. It is assumed that PNSB might possess inadequate capability to protect their cellular components from exposure to air (20.95 vol.% oxygen). In this study, therefore, Bacillus subtilis was inoculated together with a purple non-sulfur bacterium Rhodopseudomonas palustris in N-free medium in order to examine whether nitrogen fixation in Rps. palustris takes place when the co-culture is exposed to 20.95 vol.% oxygen. Rps. palustris grew and formed biofilm only when it was inoculated together with B. subtilis. When the biofilm formed in the co-culture was inoculated in N-free medium, diazotrophic growth was observed in the sequential subcultures. Expression of nifH gene, derepression of nitrogenase activity, an increase of total nitrogen, and a decrease of C/N in the co-culture of Rps. palustris and B. subtilis demonstrated the occurrence of nitrogen fixation under aerobic conditions. The diazotrophic growth was suppressed at a lower medium-to-air ratio in a sealed culture vessel, and growth of B. subtilis preceded growth of Rps. palustris in the co-culture. These results suggest that growth of B. subtilis, which is usually accompanied with oxygen consumption, might cause a decrease of dissolve oxygen concentration in medium and contribute to the occurrence of nitrogenase activity in Rps. palustris. Thermophilic methane fermentation was a valid approach for handling the stillage eluted from ethanol fermentation of waste paper and kitchen waste. The wide organic loading rate (OLR) range (2–14 g VTS/(L d)) for stable performance and relatively high energy recovery efficiency (79.0%) were achieved, and OLR of 8 g VTS/(L d) was optimum for achievement of highest biogas evolution and VTS removal efficiency. Microbial community analysis revealed that hydrolysis of cellulose was the critical step for methane production from the stillage. Sourdough is a low-pH, fermented product prepared using lactic acid bacteria and yeast mixed with rye flour, wheat flour, and water. It is used and backslopped in bakeries because it enhances texture, flavor, and dough expansion of bread. Various lactic acid bacteria and yeasts have been identified in sourdough, especially in the West. However, microbial and physical characteristics of sourdough from Japan have not been investigated. Here, we characterized the microbial composition and food component characteristics of sourdough from four bakeries in Kansai region, Japan, and performed sensory and quality evaluation of baguettes enriched with 10% sourdough. We detected different species of lactic acid bacteria such as Lactobacillus brevis, Lactobacillus alimentarius, Lactobacillus pentosus, Lactobacillus vaccinostercus, Lactobacillus sanfranciscensis, and Lactobacillus sakei. The identified yeasts primarily included Saccharomyces cerevisiae, with Candida humilis detected in some samples. Components such as amino acids, lactic acid, acetic acid, ethanol, 3-methyl-1-butanol, ethyl acetate, and phenethyl alcohol differed among samples and distinctively affected flavor, quality, and aroma of sourdough-enriched baguettes. The different species of lactic acid bacteria and the ratio of lactic acid bacteria to yeasts possibly affected food components such as free amino acids, sugars, and organic acids via the Maillard reaction, which influences the savory aromas of bread. Future investigation of the effect of lactic acid bacteria will help to improve the overall quality of bread. Koji amazake, prepared from rice koji, is a traditional Japanese sweet beverage. The main source of sweetness is glucose derived from rice starch following digestion by enzymes of Aspergillus oryzae during saccharification. The temperature of this process was empirically determined as 45°C–60°C, but no studies have systematically investigated the effect of temperature on saccharification efficiency. We addressed this in the present study by evaluating saccharification efficiency at various temperatures. We found that glucose content was the highest at 50°C (100%) and was reduced at temperatures of 40°C (66.4%), 60°C (91.9%), and 70°C (76.6%). We previously reported that 12 types of oligosaccharides are present in koji amazake; the levels of eight of these, namely nigerose, kojibiose, trehalose, isomaltose, gentiobiose, raffinose, panose, and isomaltotriose, were the highest at 50°C–60°C, whereas sophorose production was maximal at 70°C. Based on these findings, we initially performed saccharification at 50°C and then switched the temperature to 70°C. The maximum amount of each saccharide including sophorose that was produced was close to the values obtained at these two temperatures. Thus, oligosaccharide composition of koji amazake is dependent on saccharification temperature. These findings provide useful information for improving the consumer appeal of koji amazake by enhancing oligosaccharide content. We constructed a xylose-utilizing Saccharomyces cerevisiae strain using endogenous xylose-assimilating genes (strain K7-XYL). Such self-cloning yeast is expected to make a great contribution to cost reduction of ethanol production processes. However, it is difficult to modify self-cloning yeast for optimal performance because the available gene source is limited. To improve the ethanol productivity of our self-cloning yeast, a kinetic model of ethanol production was constructed and sensitivity analysis was performed. Alcohol dehydrogenase (ADH1) was identified as a metabolic bottleneck reaction in the ethanol production pathway. An ADH1 overexpression strain (K7-XYL-ADH1) was constructed and evaluated in YP (yeast extract 10 g/L, peptone 20 g/L) medium containing 50 g/L xylose as the sole carbon source. Strain K7-XYL-ADH1 showed higher ethanol productivity (13.8 g/L) than strain K7-XYL (12.5 g/L). Then, K7-XYL-ADH1 was evaluated in YP medium containing 80 g/L glucose and 50 g/L xylose; however, the ethanol productivity did not change relative to that of K7-XYL (K7-XYL 46.3 g/L, K7-XYL-ADH1 45.9 g/L). We presumed that due to the presence of glucose, the internal redox balance of the cells had changed. On culturing in an aerated 5-L jar fermentor to change the internal redox balance of cells, strain K7-XYL-ADH1 showed higher ethanol productivity than K7-XYL (K7-XYL 45.0 g/L, K7-XYL-ADH1 49.4 g/L). Our results confirmed that ADH1 was a metabolic bottleneck in the ethanol production pathway. By eliminating the bottleneck, self-cloning yeast showed almost the same ethanol productivity as genetically modified yeast. Thermobifida alba AHK119 exhibits sufficient filter paper-degradation activity in its culture supernatant. AHK119-bMs (1365 bp) and AHK119-E5 (1425 bp), which encode novel GH5 family endoglucanases, were cloned from the genomic DNA of T. alba AHK119. AHK119-bMs and AHK119-E5 consisted of 454 and 474 amino acid residues, respectively, in which the catalytic domain (CD) and carbohydrate-binding module (CBM) were connected by an accessary module (linker region). The amino acid sequences of CD and CBM of AHK119-bMs were most identical to those of endo-β-mannanases (Man5As) from Thermobifida fusca TM51, T. halotolerans YIM90462, and T. cellulosilytica TB100. In contrast, the amino acid sequences of CD and CBM of AHK119-E5 were most identical to those of endo-1,4-β-glucanases (cellulases; Cel5As) from T. fusca and T. halotolerans YIM90462. However, the linker region of both the genes shared low identities with those of Man5As and Cel5As. AHK119-bMs showed broader specificities toward cellulosic substrates than Man5As, whereas AHK119-E5 showed higher activity toward insoluble cellulosic substrates than toward soluble ones, which was conflicting when compared with other Cel5As. In addition, AHK119-bMs and AHK119-E5 showed different requirements for metal ions from those of Man5As and Cel5As, respectively. Therefore, both the enzymes were identified as novel GH5 endoglucanases, and the accessary modules seemed to play important roles in their enzymatic properties. Two new nanaomycin analogs, nanaomycin I and J, were isolated from a cultured broth of an actinomycete strain, “Streptomyces rosa subsp. notoensis” OS-3966. In our previous study, we have confirmed the occurrence of nanaomycin I (m/z = 482 [M + H]+) that lacks a pseudo-disaccharide from the mycothiol of nanaomycin H under same culture condition. In this study, to confirm the structure of nanaomycin I, the strain “S. rosa subsp. notoensis” OS-3966 was re-cultured and the target compound with m/z = 482 [M + H]+ was isolated. Furthermore, we discovered another new analog, designated as nanaomycin J in isolating nanaomycin I. The NMR analyses revealed that the structures of nanaomycin I and J are N-acetylcysteine S-conjugates without a pseudo-disaccharide and N-acetylcysteine S-conjugates without a myo-inositol of nanaomycin H, respectively. The relative configurations of the tetrahydropyrane moiety of nanaomycin I and J were determined by rotating-frame overhauser effect spectroscopy (ROESY) analysis. Absolute configurations of the N-acetylcysteine moiety of nanaomycin I and J were determined by advanced Marfey's analyses for acid hydrolysis of de-sulfurized nanaomycin I and J with Raney nickel. Nanaomycin I and J showed moderate cytotoxicity against several human tumor cell lines. The human mitochondrion-derived calcium transporter Letm1 was synthesized by reconstituted in vitro transcription-translation (IVTT) in cell-sized liposomes and the dependency of Letm1 on phospholipid composition was investigated. Components for IVTT were encapsulated into cell-sized vesicles together with the DNA encoding Letm1, thereby preparing proteoliposomes. The synthesis of Letm1 and pH-dependent calcium transport activity were confirmed by flow cytometry. Finally, we investigated the effect of phospholipid composition on Letm1 transport activity and found that cardiolipin present in the mitochondrial membrane plays an important role on the transport activity of Letm1. Resveratrol and its methyl ethers, which belong to a class of natural polyphenol stilbenes, play important roles as biologically active compounds in plant defense as well as in human health. Although the biosynthetic pathway of resveratrol has been fully elucidated, the characterization of resveratrol-specific O-methyltransferases remains elusive. In this study, we used RNA-seq analysis to identify a putative aromatic O-methyltransferase gene, AcOMT1, in Acorus calamus. Recombinant AcOMT1 expressed in Escherichia coli showed high 4′-O-methylation activity toward resveratrol and its derivative, isorhapontigenin. We purified a reaction product enzymatically formed from resveratrol by AcOMT1 and confirmed it as 4′-O-methylresveratrol (deoxyrhapontigenin). Resveratrol and isorhapontigenin were the most preferred substrates with apparent Km values of 1.8 μM and 4.2 μM, respectively. Recombinant AcOMT1 exhibited reduced activity toward other resveratrol derivatives, piceatannol, oxyresveratrol, and pinostilbene. In contrast, recombinant AcOMT1 exhibited no activity toward pterostilbene or pinosylvin. These results indicate that AcOMT1 showed high 4′-O-methylation activity toward stilbenes with non-methylated phloroglucinol rings. A high copy number mutant plasmid, designated pVC7H1, was isolated from an Escherichia coli–Corynebacterium glutamicum shuttle vector pVC7N derived from cryptic plasmid pAM330 that was originally found in Brevibacterium lactofermentum 2256 (formally C. glutamicum ATCC 13869). The copy number of pVC7N was estimated to be about 11 per chromosome, whereas pVC7H1 displayed a copy number of 112 per chromosome in C. glutamicum. The mutation (designated copA1) was in a region between long inverted repeats (designated the copA1 region) and was identified as a single base conversion of cytosine to adenine. By introduction of a cytosine to guanine mutation (designated copA2) at the same site as copA1, a further high copy number mutant (>300 copies of the plasmid per chromosome) was generated. 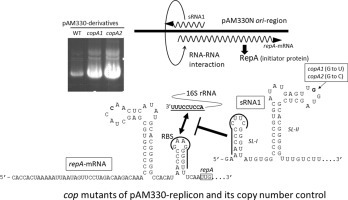 Through genetic and RNA-Seq analyses of the copA1 region, it was determined that a small RNA (designated sRNA1) is produced from the upstream region of repA, a gene encoding a possible replication initiator protein, and sRNA1 is a possible regulator of the copy number of pAM330-replicon-contaning plasmids. Determination of the precise transcription start sites of sRNA1 and repA-mRNA suggested that sRNA1 could sequester a presumed ribosome binding site of repA-mRNA from ribosomes by an antisense RNA-mediated mechanism. Our data also indicate that the secondary-structure of sRNA1 is crucial for its function in plasmid copy number control. Investigating neural differentiation of pluripotent stem cells, including induced pluripotent stem (iPS) cells, is of importance for studying early neural development and providing a potential source of cells for nerve regeneration. Stromal cell-derived inducing activity (SDIA) using PA6 stromal cells promotes neural differentiation of iPS cells. Thus, we hypothesized that cadherin gene-engineered PA6 feeder cells will enhance the performance of SDIA by facilitating cell–cell interactions. Consequently, we created cadherin gene-engineered PA6 cells. Efficiency of neural differentiation from mouse iPS cells on PA6 feeder cells overexpressing E-cadherin gene (46%) or N-cadherin gene (27%) was significantly higher compared with parental PA6 feeder cells (19%). In addition, efficiency of motor neuron differentiation from mouse iPS cells on cadherin-gene engineered feeder cells (E-cadherin, 7.4%; N-cadherin, 11%) was significantly higher compared with parental PA6 feeder cells (4.1%). Altogether, these results indicate that cadherin gene-engineered feeder cells are a potent tool for promoting neural differentiation of pluripotent stem cells. Ribulose-1,5-bisphosphate (RuBP) carboxylase/oxygenase (RuBisCO) generates 2-phosphoglycolate (2PG) as one of the metabolites from the Calvin-Benson-Bassham (CBB) cycle. In this study, we focused on the fact that glycolate (GL) derived from 2PG can be incorporated into the bacterial polyhydroxyalkanoate (PHA) as the monomeric constituent by using the evolved PHA synthase (PhaC1PsSTQK). In this study, the function of the RuBisCO-mediated pathway for GL-based PHA synthesis was evaluated using Escherichia coli JW2946 with the deletion of glycolate oxidase gene (ΔglcD) as the model system. The genes encoding RuBisCO, phosphoribulokinase and 2PG phosphatase (PGPase) from several photosynthetic bacteria were introduced into E. coli, and the cells were grown on xylose as a sole carbon source. The functional expression of RuBisCO and relevant enzymes was confirmed based on the increases in the intracellular concentrations of RuBP and GL. Next, PHA biosynthetic genes encoding PhaC1PsSTQK, propionyl-CoA transferase and 3-hydroxybutyryl(3HB)-CoA-supplying enzymes were introduced. The cells accumulated poly(GL-co-3HB)s with GL fractions of 7.8–15.1 mol%. Among the tested RuBisCOs, Rhodosprium rubrum and Synechococcus elongatus PCC7942 enzymes were effective for P(GL-co-3HB) production as well as higher GL fraction. The heterologous expression of PGPase from Synechocystis sp. PCC6803 and R. rubrum increased GL fraction in the polymer. These results demonstrated that the RuBisCO-mediated pathway is potentially used to produce GL-based PHA in not only E. coli but also in photosynthetic organisms.